This writing project is all about things that give me joy, and sharing that joy in the hopes that you find something along the way which can give you some of the same happiness I’ve found. Or, remembering why you fondly remember some of the same things I have. This week’s installment is located at the intersection of The Hero(ine)’s Journey and The Power of Friendship, assuming that these roads can be traveled via pirate spaceship. And it’s a pure delight. Mouretsu Pirates started, as so many recent anime have done, as a light novel series. 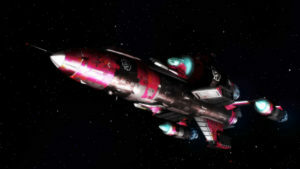 The series runs 26 episodes long, followed by a theatrical film that is essentially a better-produced episodic adventure placed shortly after the series’ timeline. The show’s official English title is Bodacious Space Pirates and that’s the last time I’m mentioning that fact because seriously, no. 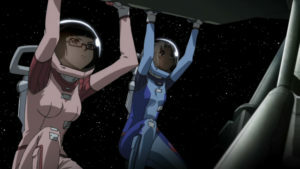 Marika is living a normal school life, with a part time job and hobby time spent in the space yacht club, when she is informed of her late father’s bequest: Captaincy of a pirate ship. The laws state that pirate ships must pass from parent to child or risk decommissioning. Of course our plucky heroine takes up the challenge of space piracy, otherwise there wouldn’t be much of a plot. 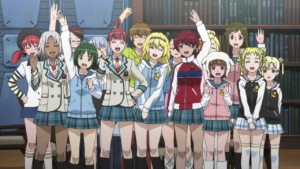 The point of the show, however, is watching Marika and her friends and her new crew as they get used to the change in circumstances. She has to learn the ropes of the piracy business (and business it is!) as well as grow into her innate talent for the tactics of space combat while maintaining her grades and keeping up her part-time job at the cafe. Busy girl! 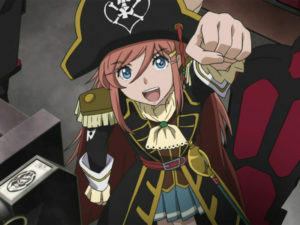 Rocking that captain’s uniform, Marika! You realize very early on that this isn’t being played for heavy drama. There’s no grimdark here. It’s not that kind of show. You can simply relax and enjoy the ride on the fun train. I’m here for the great characters, the clever tactical stuff, the smart and funny writing, and the overall sense of delight. The show is almost an ensemble but Marika is at the heart of nearly everything going on. Her knack at befriending useful people is a big contributor to her increasing success. But she’s not one of those characters for whom everything comes too easily. We get to watch her try things out, establish her sense of place, step out of her comfort zones. Yes, she’s the central figure and the show is deliberately upbeat, but it doesn’t feel like her accomplishments are cheap and there’s a good sense of character progression. Also: Space pirates. I mean, come on now. 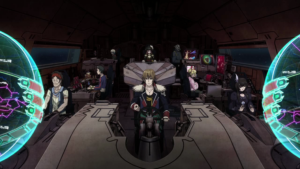 Pictured: What you sort of expect a space pirate crew to look like. If you want something with a bit more dramatic heft, more edge, then Mouretsu Pirates probably isn’t your cup of tea. Also, this is a world full of schoolgirls. The dudes don’t factor in very much or very often. Pictured: What you do NOT expect a space pirate crew to look like. Maybe you’re allergic to joy. I don’t know your life. The ending theme song, “Lost Child,” is among my all-time favorite anime-related tracks of all time. The opening theme song, whose title I shall not try to reproduce here, is… certainly several minutes of sounds, yes indeed. Hooboy. Problems are usually solved, in this show, by clever people figuring out smart solutions. Everyone has a strength that will get played to somewhere along the way, but they’re going to have to work hard for their successes. Chiaki is better than you at everything. Everything except being cheerful. The series and movie are available on Blu-Ray, and you can stream the series at Crunchyroll.